Join us at our winter Family Day and celebrate this magical time of year. Bring friends and family together and be creative with a range of free arts and craft workshops and get competitive in our programme of sports activities – all inspired by the festive season. Enjoy tasty treats from our food market and cafés, guaranteed to warm you on the coldest of days, or bring a packed lunch and explore our new Art and Nature Trail. Don’t forget your wellies! Get cosy in our theatre, studio and concert hall and enjoy our family theatre show Wilde Creatures, Lord of Strut’s dance fantasy adventure, and a performance of Handel’s Messiah by our very own University of Warwick Symphony Orchestra. Tickets are on sale now. 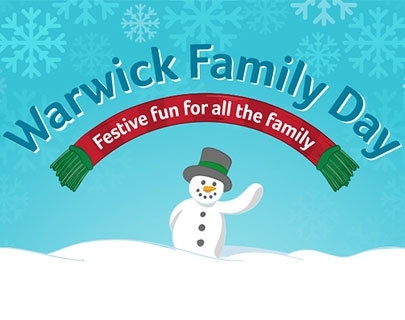 Family Day is brought to you by Warwick Arts Centre, Warwick Sport and Warwick Retail. It’s a day event that brings together a rich mix of family friendly arts and sports activities across the University of Warwick’s campus.